Whether it’s Copper, Brass or CPVC – Cast Iron or PVC, MacCo has the expertise, resources and skill set to deliver a successful project. 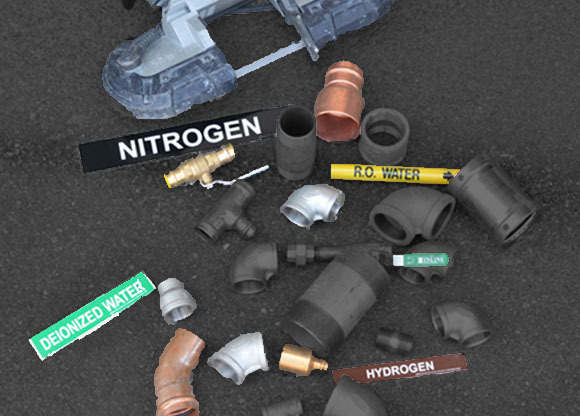 MacCo has decades of experience in all facets of Residential, Commercial and Industrial Plumbing Systems. Plumbers are one of the first contractors to arrive at a project and typically one of the last to leave. Planning is essential and MacCo takes pride on always having forethought for the end user and final product. These are just a few examples of what separates MacCo from the rest. 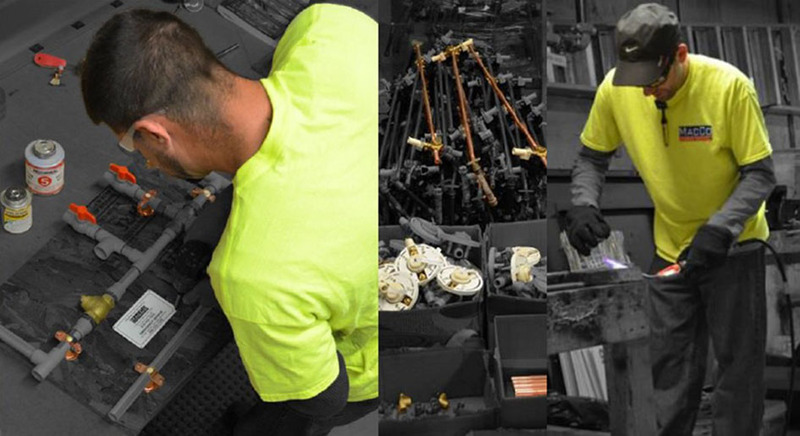 Our skilled Sheet Metal Workers, Pipe Fitters and Service Technicians are provided with excellent training, state-of-the-art equipment and knowledgeable leadership. 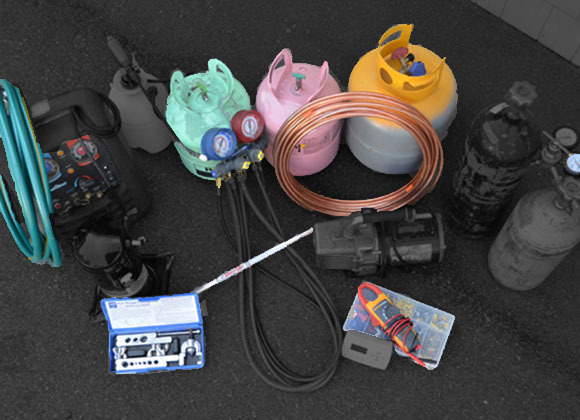 These tools are the foundation that allows our skilled craftsmen to provide a premier HVAC System with each and every installation completed. Whether it’s -10F or 105F, HVAC systems must be fully functional in order to provide maximum efficiency and enjoyable living. Whether installing Boilers, Chillers, Split Systems, Rooftop Units, Cooling Towers or Air Handling Units, longevity and cost savings directly correlate with a quality installation. Most everybody uses Gas in some form or fashion throughout the day. For Heating, Cooking, Hot Water or Laundry, MacCo can provide a wide variety of different Gas systems to suit your needs. 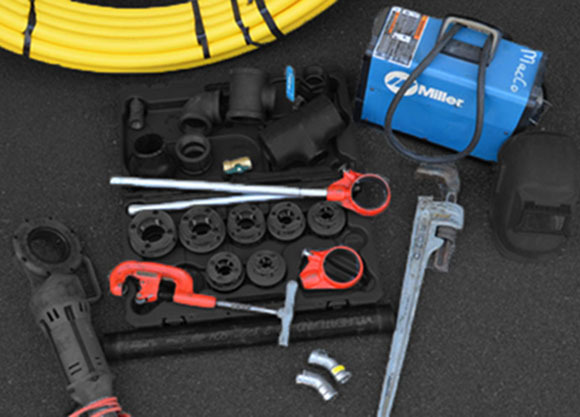 From Welded, Elevated Pressure Systems for high volume demands, multiple Gas Mains for Individual Tenant Metering or even just simple utility conversions, MacCo can facilitate whatever is required using only the best in quality for materials and excellent workmanship. 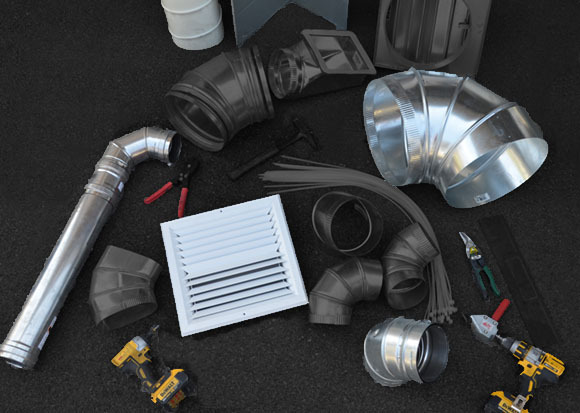 MacCo installs a wide range of Duct systems to suit any application. From Exposed Spiral Duct for Open Concept Lofts, Welded Grease Exhaust for Restaurants or Plastic-Coated Duct for Chemical Exhaust, the team at MacCo has the ability and proficiency to relay your project on time and on budget. Where every project is unique, MacCo employs a strong team of Sheet Metal Workers and Project Managers who are equipped with the abilities to provide a strong, durable system. 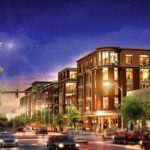 Whether it’s Multi-Unit Residential, Townhouses/Condominiums, Restaurant/Retail, Commercial Shell/Core or Tenant Improvements,, our team of Skilled Craftsmen and Project Managers will build what you envision. MacCo has an extensive resume which supports our consummate knowledge of elaborate Process Piping systems. Our crews of Plumbers and Pipe Fitters are progressively adept in various types of Piping Systems serving many Healthcare, Manufacturing and Pharmaceutical facilities. MacCo prides itself on upholding a stellar Safety rapport with many of our clients. Through continuing education and training, MacCo’s workforce is quite often known as the safest subcontractors on the job. 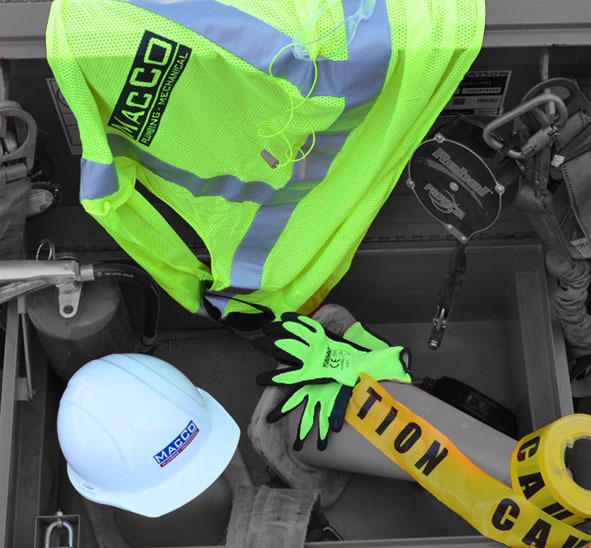 MacCo provides all of our workers with Safety Kits upon employment. All of MacCo’s jobsites require that Personal Protective Equipment (PPE) and High-Visibility Clothing be worn at all times. Toolbox Safety Trainings are conducted by Project Foreman to ensure that all employee’s are focused on working as safely as possible. MacCo is committed to providing a work environment that paves the way for our workers to be safe while working on our projects. The overall success of MacCo hinges on our employee’s effectiveness and productivity. Providing hazard-free working spaces along with preemptive planning to allow for sound execution. 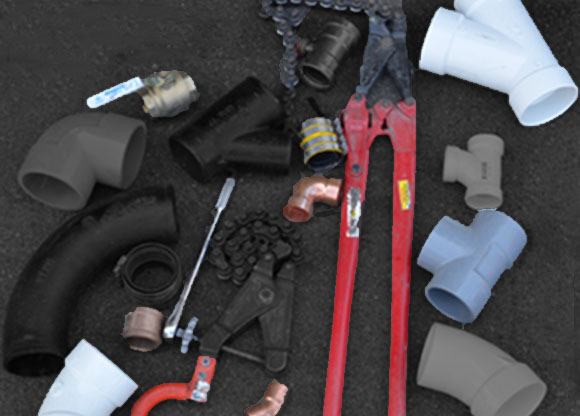 MacCo has deep roots within the Plumbing and HVAC service industry. In our earlier years, MacCo forged many of its long-standing relationships by offering premier 24-hour/365-day service for our clients. As MacCo’s clientele began to expand, the company saw it necessary to bolster its offerings and formed a dedicated Service Division – MacCo Energy. The ability to provide Emergency Service and Preventative Maintenance to our clients allows for us to provide continued support to our projects even after the construction is complete. MacCo also has extensive experience in Retrofitting and Renovating older properties using today’s latest technologies. Our Service Managers and Technicians are equipped with a wealth of knowledge when it comes to sustainability and energy efficiency. We understand that each property or facility is different which is why we pride ourselves on our ability to listen to our customers needs and help with making the best informed decision to benefit the end users long term interest. To aid our technicians in providing the best service possible, each technician is provided with a fully-stocked service vehicle, equipped with a smartphone and tablet. Each tablet is capable of linking directly to our office and has the ability to track service records, maintenance recommendations and scheduling. This allows for us to help our clients with Budgeting and Asset Management. Many times, MacCo’s team of Estimators and Executives begin working for the project before the project documents are even completed. With our vast experience in many different sectors or work, we have collected significant data that can help to suggest Value Engineering opportunities when initially submitting a quotation to a client. With this, we are able to help bring projects costs in on-budget while providing time savings to the overall project schedule allowing the end user to begin operating sooner. 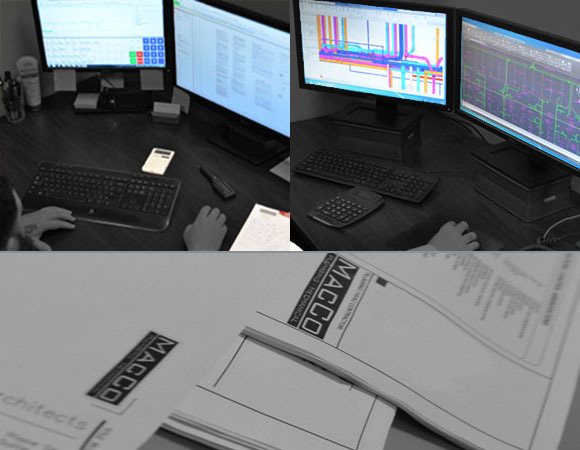 MacCo specializes in Design/Build projects. We are directly affiliated with a full-service, MEP/FP Consulting Engineering firm. 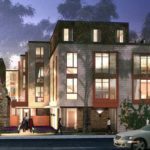 This, coupled with over 40 years of industry experience, allows us to design a cost-effective system while meeting the overall intent of the project. Our ability to manage the design process saves significant time throughout the design process and alleviates the need for drawing revisions in most cases. MacCo uses the most innovative technology for MEP/FP Coordination. With both CADD and 3-Dimensional, Building Information Modeling (BIM) happening in-house under our own direction, we are able to simplify tasks and provide conflict resolution before mobilizing to the field. Our experienced CAD Designers have assisted is saving significant amounts of unnecessary rework through forethought and inventive suggestions early on in the design process. MacCo currently operates a fully-equipped,13,000 square foot Pre-Fabrication facility. With storage space area on jobsites typically at a premium, our state-of-the-art facility allows for us to build much of the work offsite. With this, we can monitor the project’s schedule and work closely with our clients to coordinate our site delivery schedules. Our fully-stocked warehouse allows for quick-turnaround upon requests from our CAD Designers, Project Managers and Project Foreman allowing minimal downtime while giving overall time savings to the project schedule. 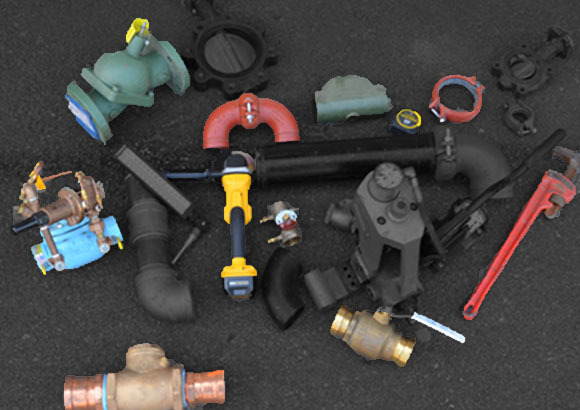 Upon receipt of an order our crew of Plumbers and Welders quickly begin to assemble all of the major components that will keep building’s operational for many years.